Examples of grisaille underpainting above. In all these paintings watercolors were eventually applied over the grey ink. one that I really liked, and that is Noodler’s Lexington Grey. A friend from Europe has been painting with this yummy grey. Super5 is my favorite brand, and the grey is Super5 Frankfurt ink. Understand that is is selling on Amazon right now as a BROWN — NOT! Update: You can also get it at Blue Rooster! it does not bleed at all on any paper I’ve tried it on, whereas, as you can see from the waterwash over the pen ink marks, the Lex will bleed slightly on many papers. but I always test it at the back of any new journal. UPDATE: Now I paint a lot with many inks and like the effect of both! Document Fog Grey ink, above. It is simply too blue to be called a grey. Look at it compared to their Document Blue. I have a confession to make. I love buying ink samples from Goulet, but lately I’ve bought the same three over and over (duh!) 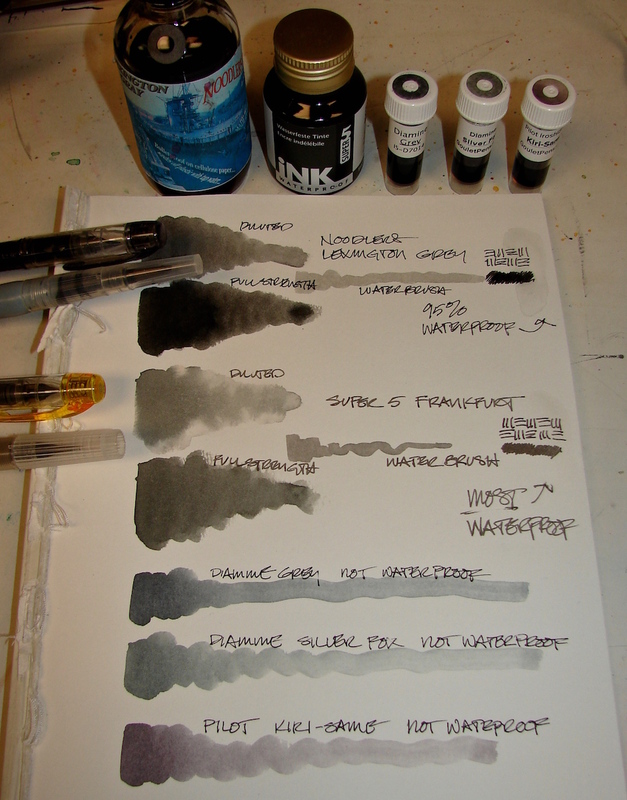 exploring non-waterproof gorgeous grey inks. These are the three I’ve purchased in tiny ink samples. I doubt I will buy them full size. as only two inks I know of are tested for lightfastness, De Atramentis and Super5. Pilot Preppy pen with Super5 Frankfurt (Amazon or from Blue Rooster. 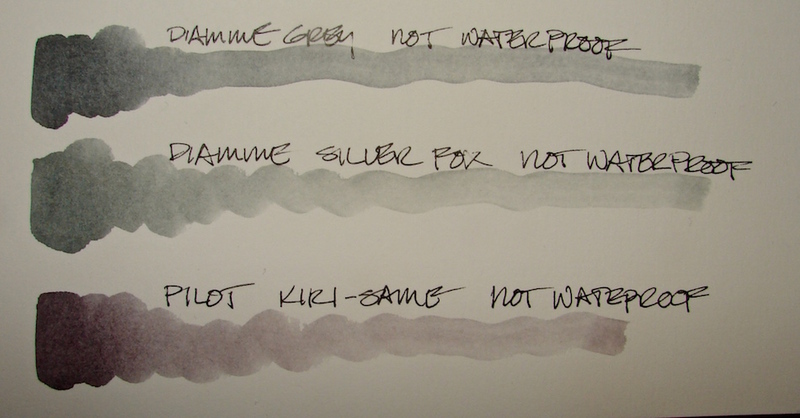 Diamine Grey, Diamine Silver Fox, Pilot Kiri-Same sample sizes from Goulet. This entry was posted in color, pen & ink, review, tools and tagged Alphabet District Portland, architecture, art journal, Diamine Ink, grisaille, grisaille underpainting, Lexington Grey Noodlers ink, Pilot ink, Platinum Preppy pen, Portland Urban Sketchers, Super5 ink, urban sketcher, USk, virtual sketchwalk, waterbrush. Bookmark the permalink. I do grisaille work all the time, both as underpainting and in monochrome pieces, and I now exclusively use Noodler’s Lexington Grey. It sometimes breaks down a little into a pale blue but is otherwise a really trustworthy true grey. I like that I can dilute it even to 50/50 and it remains permanent and waterproof. Lex has been my go-to for a long time and I still love it.